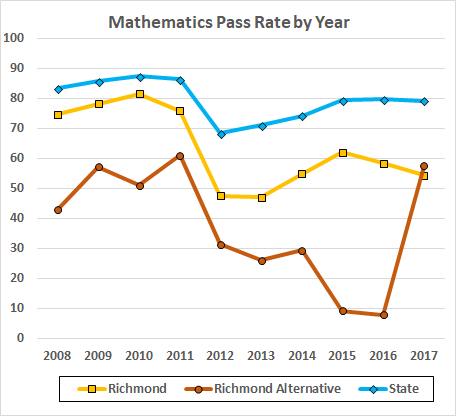 The Richmond School Board has extended its relationship with a for-profit company that has overseen academic gains at the city’s alternative school but has faced allegations of abuse elsewhere. The decision, made last week without notice, has raised concerns from residents who’d hoped to weigh in on the decision. The 6-1 vote to exercise a second-year option on the contract with Texas-based Camelot Education was not on the School Board’s original agenda, but added to it at the beginning of the meeting. 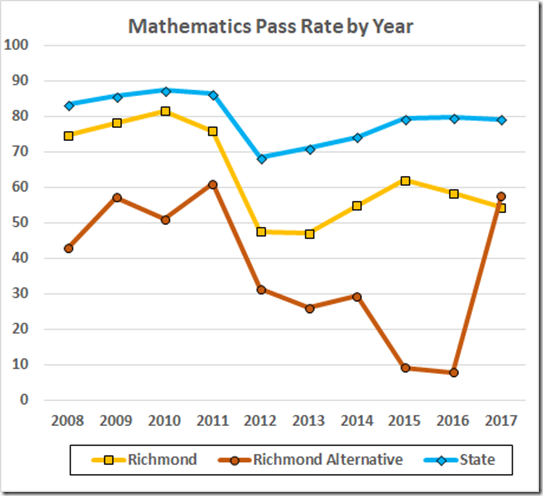 We have seen that Richmond’s receptacle for disruptive students, Richmond Alternative, was doing a remarkable job with a tough crowd until RPS took it over from the contractor in order to save $2 million per year. 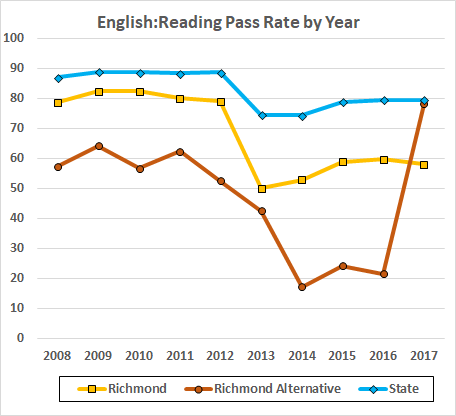 Pass rates then plummeted. Richmond then reconsidered and in ‘16 handed the school over to another contractor. 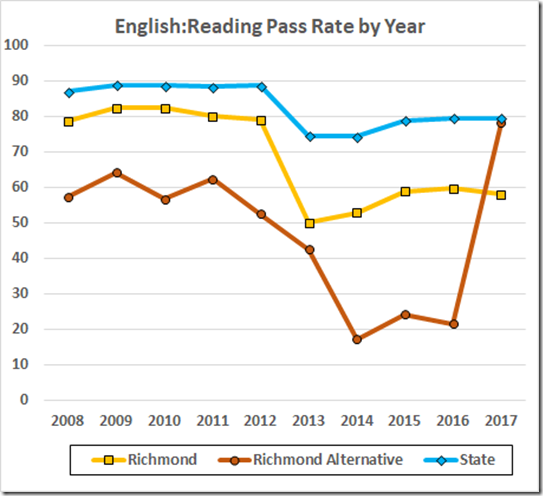 Note: The Richmond and state data include scores from the elementary grades; they may be helpful for trends (e.g., the drops with the new math tests in 2012 and the new reading tests in 2013) but are not directly comparable to the Alternative pass rates. Perhaps the 2017 increases, 56.8 points in reading and 49.7 in math, represent “academic gains.” Let’s hope so. As well, let’s hope our new Superintendent has been informed by the unusual gains at Carver and other schools and will look under the numbers. For sure, the Department of “Education,” which investigated only one instance of cheating this year – and then only when the local Superintendent called them in – will marinate in its delight with the increased pass rates and will look under those numbers – no matter how unlikely they may be – only when somebody else points out a problem.